Best known for leading the construction of the Panama Canal, George W. Goethals (1858–1928) also played a key role in the decades-long reform that transformed the American military from a frontier constabulary to the expeditionary force of an ascendant world power. George W. Goethals and the Army is at once the first full account of Goethals’s life and military career in ninety years and an in-depth analysis of the process that defined his generation’s military service—the evolution of the US Army during the late nineteenth and early twentieth centuries. George W. Goethals was a lieutenant and a captain during the post-Reconstruction years of debate about reform and the future of the army. He was a major when the most significant reforms were created, and he helped with their implementation. As a major general during World War I, he directed a significant part of the army’s adaptation, resolving crises in the mobilization effort caused largely by years of internal resistance to reform. Following Goethals’s career and analyzing reform from his unique perspective, military historian Rory McGovern effectively shifts the focus away from the intent and toward the reality of reform—revealing the importance of the interaction between society, institutional structures, and institutional culture in the process. In this analysis, Goethals’s experiences, military thought, managerial philosophy, conceptions of professionalism, and attitude about training and development provide a framework for understanding the army’s institutional culture and his generation’s relative ambivalence about reform. 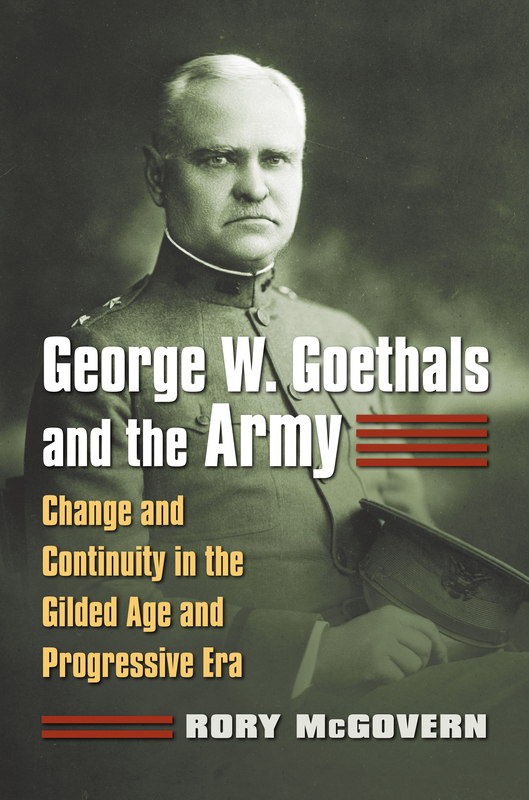 In its portrait of an officer whose career bridged the distance between military generations, George W. Goethals and the Army also offers a compelling and complex interpretation of American military reform during the Gilded Age and Progressive Era—and valuable insight into the larger dynamics of institutional change that are as relevant today as they were a century ago. Rory McGovern holds a PhD in history from UNC Chapel Hill and is a major in the United States Army. He has served in tactical, operational, and institutional capacities, including two combat tours in Iraq and an assignment as an assistant professor of history at the United States Military Academy at West Point.